Rudolf Nureyev one of the most celebrated ballet dancers of the 20th century, who had defected from the Soviet Union at the young age of 23, died of AIDS related problems on 6th January 1993 Paris. He was buried in Russian cemetery in Sainte-Geneviève-des-Bois close to Paris. 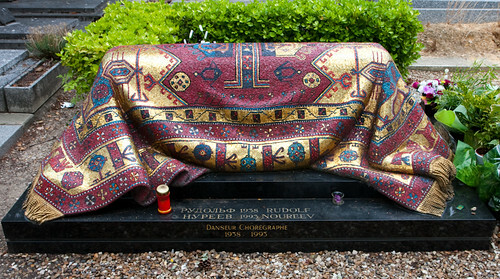 In 1996 his friends and admirers built a beautiful memorial to him in the shape and colours of the oriental kilim rug which Nureyev loved to carry with him. The rug designed by his artist friend Ezio Frigerio is made of mosaic tiles of several shades of red, blue and gold. 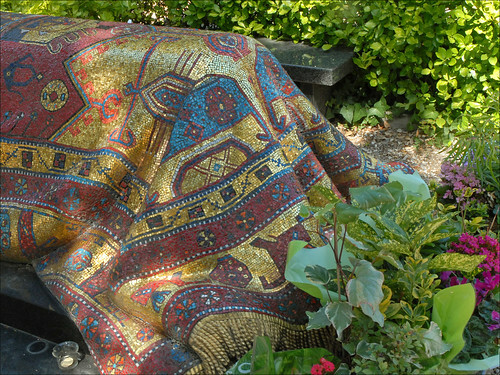 Draped over his grave it not only looks magnificent but also has look of real rug with a warm feel. Chiffon brodeuse Blog - Some good close up pictures. It is so incredible!!!! Wish I can ever see it.... thanks for bringing such unusual wonders to us. The most gorgeous grave ever. How was that mosaic work executed? It is exquisite and never ceases to amaze me. I, too, hope to see it in person one day. Hi Debra - When you visit the cemetery please note the location of the grave (if possible the coordinates) and let me know the same so that I can exactly mark it on Google Earth.